Last of the S-Class series from Imabari Shipbuilding. OOCL announced today June 29, 2007 (Friday) the christening of its eighth 5,888-TEU vessel. Last of the S-Class series from Imabari Shipbuilding. OOCL announced today June 29, 2007 (Friday) the christening of its eighth 5,888-TEU vessel. It is the last of the eight S-Class series built by Imabari Shipbuilding Co., Ltd, Japan. The newbuilding was named the m.v. 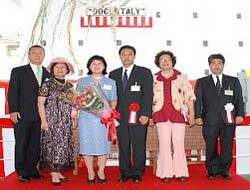 OOCL Italy by sponsor Dr. Rulin Fuong Tung, the wife of Mr. Andy Tung, Director of Corporate Planning and Marketing of OOCL. Leam Chabang / Singapore /Colombo / Jeddah / Gioia Tauro / Halifax / New York / Savannah / Norfolk / New York / Halifax / Gioia Tauro / Jeddah / Colombo / Singapore and back to Leam Chabang in a 63-day round trip. Orient Overseas Container Line (OOCL) is a wholly-owned subsidiary of Hong Kong Stock Exchange-listed Orient Overseas (International) Ltd. Headquartered in Hong Kong, OOCL is one of the world's leading container transport and logistics service providers, with more than 230 offices in 58 countries. Linking Asia, Europe, North America, the Mediterranean, the Indian sub-continent, the Middle East and Australia/New Zealand, the company offers transportation services to all major east/west trading economies of the world. OOCL is one of the leading international carriers serving China, providing a full range of logistics and transportation services throughout the country. It is also an industry leader in the use of information technology and e-commerce to manage the entire cargo process.